These handcrafted “Life Enhancement” bracelets and accessories are designed and made from hand blown glass beads and stones gathered from all over the world. All beads, stones and colors are specifically chosen and arranged to create a special meaning or “story” for the bracelet. Most glass beads come from India, Czech Republic and Italy. 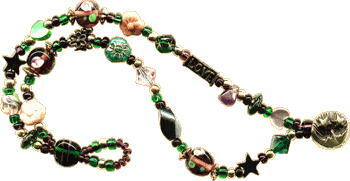 Each bracelet,necklace,anklet or earring is made using the finest materials. The wire is a 49-strand, .024 nylon coated, stainless steel cable for rugged durability. Each piece is shipped with it’s own wallet size “Story Card”.